Properly done, a dental crown on an implant will look, feel and function like a natural tooth. Dental Implants are replacement tooth roots and are used to put back missing teeth. The implant is usually placed into the bone in the same position as the original tooth root and after a healing period a dental crown is then placed onto the implant. Properly done, a dental crown on an implant will look, feel and function like a natural tooth. The case below is of a lady who lost a front incisor tooth. An implant was placed and a temporary crown placed onto the implant. Three months later a ceramic crown was made and placed onto the implant in place of the temporary. To see which tooth is the implant and crown move the mouse pointer over the image. Most Dental Implants are made from a special surgical grade of Titanium. They were first used back in the 1950’s when Professor Branemark, who is considered the pioneer of dental implants, discovered that Titanium would fuse to bone and was completely biocompatible – ie would not get rejected by the body. Prof. Branemark then developed some of the first dental implants which have been in use for over 40 years. Some newer implant systems are made from ceramic but there are no long term clinical trials yet to see how long they will last for. There are many different makes of dental implant which can seem a bit confusing to dentists let alone patients. Most dentists who place implants may use one or two systems at most as the cost of all the equipment to place implants is expensive and each system tends to have it’s own specialised equipment. The most widely used and clinically tested implant systems include Bicon, Nobel Biocare, Straumann (ITI), Ankylos, and Astra. What can Dental Implants be used for? Dental Implants can be used to replace one or more missing teeth. They can be used individually, one implant per missing tooth, or it may be possible to use fewer implants and make dental bridges if replacing lots of missing teeth. In the example below, the patient had a missing back molar tooth on their right side and three missing back teeth on the left. A single implant (Bicon) and crown was used on the right and two implants (Bicon) supporting a three tooth ceramic bridge on the left. People with full dentures can also often be helped with implants. Sometimes two implants can be placed and the denture then clips onto the implants to hold it in place. It is still removable but is now securely anchored making wearing a full denture much more comfortable. Another technique is to place four implants and a denture is permanently secured to the four implants. This is sometime called the ‘all on four technique’. Not everyone is suitable for dental implants. The most important consideration is the amount of bone required to support the implant. When you loose a tooth the bone that held the tooth root in place often shrinks and sometimes there is simply not enough depth or width of bone left in which to place an implant. A good quality digital X-ray can give an idea of the amount of bone however ideally a CT scan should be taken as this gives a true 3D X-ray of how much bone there is and how hard or soft the bone is. If there is not enough bone then it may still be possible to have an implant with a bone graft. In the upper jaw this is often called a sinus lift procedure. Grafting is generally very successful though it does add to the cost (£500+) and also the graft can take 6 months or longer to heal before the implants are placed. Some implants such as Bicon are much shorter and can often be placed even with limited amounts of bone and therefore avoid the need for bone grafting. Overall health is also an important consideration. Certain medications, people with high blood pressure, bleeding disorders or heavy smokers may not be suitable for dental implants. Generally, implants have a 95-98% success rate. Failure either occurs in the beginning in that the implant fails to heal (osseointegrate) into the bone or years later if the bone recedes away from the implant. 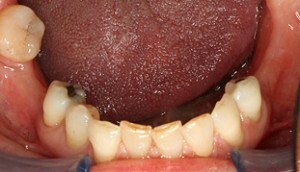 This condition is called peri-implantitis and is a similar process to gum disease (periodontitis). Dental implants cannot decay like teeth but they can suffer from gum disease if the teeth are not cleaned properly. Excellent oral hygiene is a must for keeping implant teeth healthy. A good brushing technique with a quality electric brush, use of dental floss or tape and inter dental brushes are all required to keep implant teeth, and all teeth, healthy. Properly cared for, implants could last a lifetime. Not all dentists place implants though some dentists do restore implants, ie make the crown on an implant already placed. If your own dentist doesn’t place implants then they may refer you to a colleague who does. If not, you can find an implant dentist near to you. As with finding a cosmetic dentist, experience in placing implants is important. Find out what implant system the dentist uses and do have a look on the website for that system. Ask how many they have done, their own personal success rate and if they have before and after photos of patients successfully treated? Good quaility digital X-rays will also be required and ideally a CT scan. Does the practice have digital X-ray equipment or a CT scanner? Quite a few dental practices now have in-house CT scanners and many implant dentists would consider a CT scan essential prior to implant surgery. CT scans cost from £100 up, depending on how big an area needs to be scanned. As with all things, cost is a factor, but you would be best to be careful of some of the very cheap implants being advertised on the internet. Many of those clinics were unable to tell us what implant system they used. Would you buy a secondhand car if you didn’t know what make and model it was let alone have an implant placed into your body without knowing what make it is? All the main implant companies manufacture their implants to incredibly high medical standards which is not the case for cheap, made in China, unbranded implants which, surprisingly, dentists are free to buy and use. The same goes for having work abroad – do your research and properly work out the costs and extra time costs involved, traveling, hotels. If you need time off from work that costs you money! Also, who would you see if there was a problem? There have been many cases documented in medical implant journals where things have gone badly wrong just a year or two after treatment from clinics in eastern Europe. A lot of clinics abroad do not have to comply with the very high standards required of UK dental practices. Expect to pay around £800-£1000 for a single implant and £600-800 for the final implant post and crown. £100 + for a CT scan and £35-60 for a an OPG X-ray. Placing a second, third or more implants usually costs appreciably less.